There are certain clothing items that I consider an extreme indulgence and fancy lounge pants is one of them. 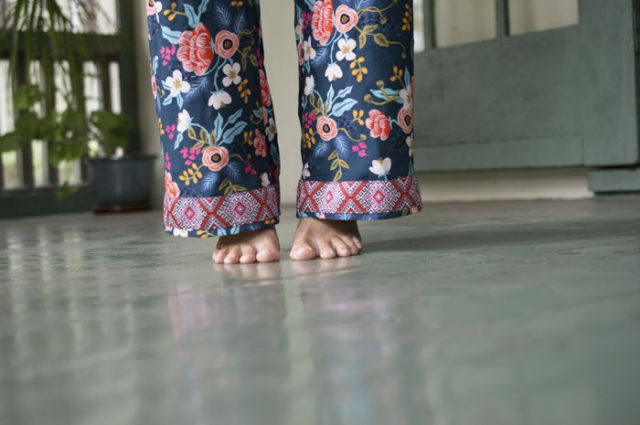 Let’s be honest, any old pair of sweatpants will generally suffice when it comes to at-home casual wear. As a Minnesota-born woman, it’s effectively burned into my DNA to avoid excess luxury and always make do with what is sufficient…I don’t paint my nails, I barely even moisturize my skin. I’m slow to accept indulgences into my life. As you can imagine, upping my lounge pants game is like going seriously fancy lady. But, when I came across the rayon floral prints designed by Anna Bond of Rifle Paper Co. for Cotton and Steel and felt how silky soft it is all I could think of was making the perfect pair of lounge pants. I went for it, I went full fancy lady folks. And, these are perfect. 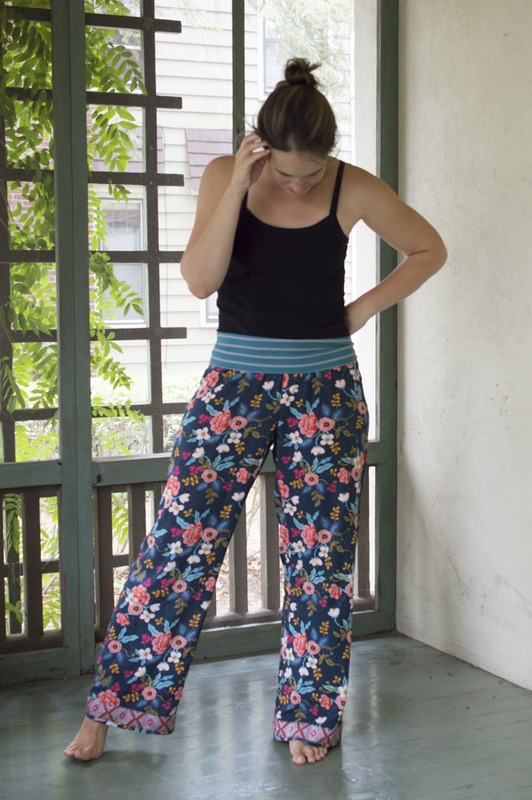 I hacked the Taylor Made Pajama Pants pattern, which I have had forever, by widening the hem and adding a thick jersey knit waistband. I also stitched on some of my favorite trim, an Amy Butler design from Renaissance Ribbon. These came together very quickly. I had to seriously stretch the waistband fabric to match it up with the waist of the pant legs but it was a wrestling match worth the effort. 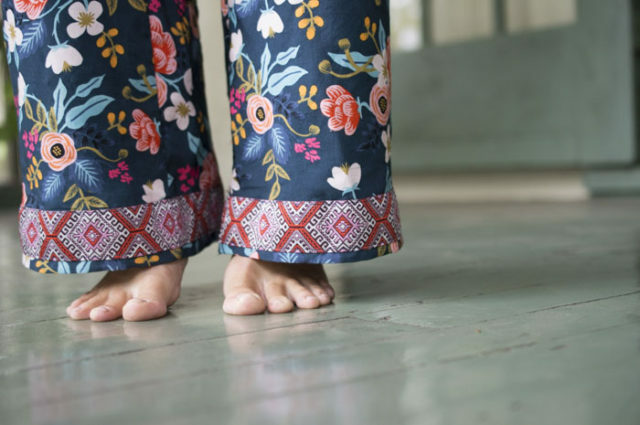 Otherwise, they were simple, as pajama pants usually are. With the weather finally turning colder, I do find the rayon a bit cold against my skin but that’s all the more reason to lounge in front of the fire. Right?! Haha! I know, right?! It feels like such an indulgence but I think we are both worth it! Go for it. Aw, thanks gorgeous. 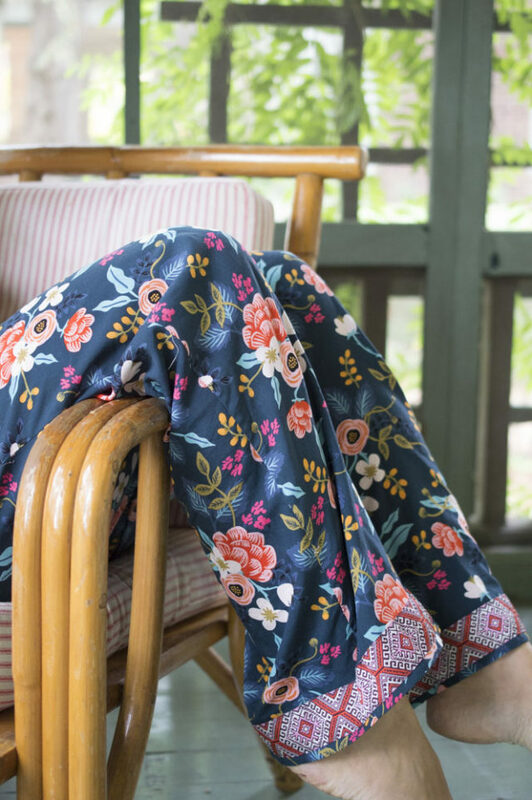 I LIVE in these pants once the weather warms up…they are the best. I love these! 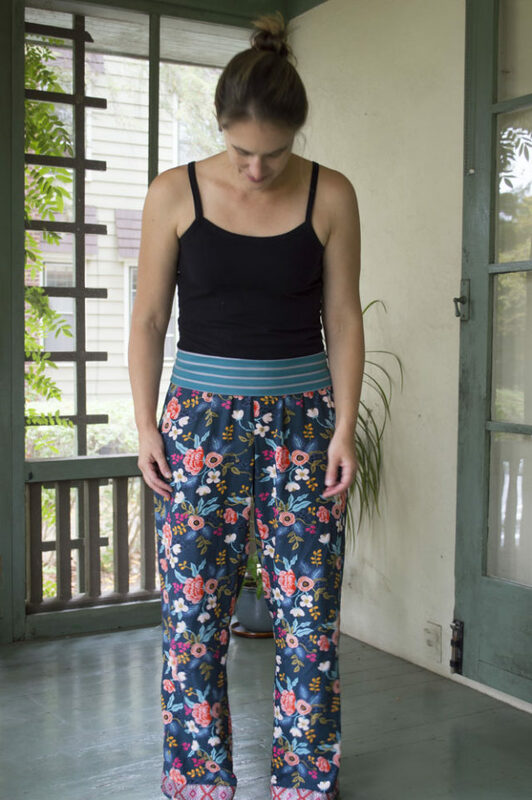 For the knit waistband, did you follow any guidance so you knew how wide to make it? I made it 15″ tall (as I fold it over to sew it on the waistband and then often fold that down). As for the width, I actually take the knit fabric itself and stretch it around my body until it’s a good tight fit, then I measure what that comes to and cut it that width. I find that knits behave so differently, I do this method because measurements come out different based on the stretch of the material. Then, I stretch the material as I sew it to the waist of the rayon pants so they raw edges meet. That way it bounces back to create a lovely, gently, non-elastic waistband. Thank you so much for the guidance! I just cut out my rayon pieces, and am about to start the waistband. 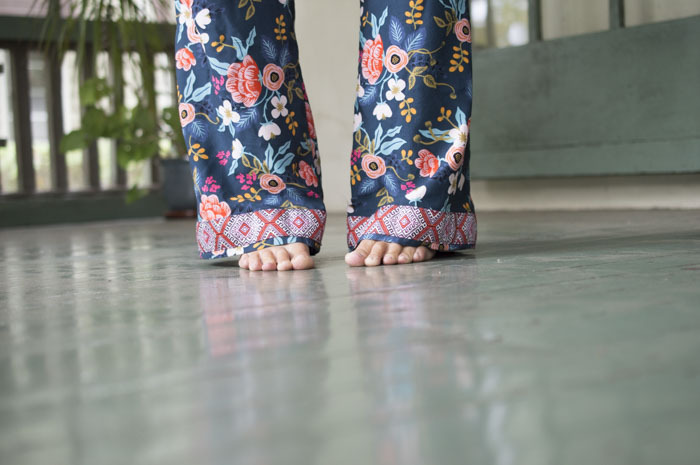 Did you take any height off the waist of the rayon part of the pants? I did! My original pattern had an elastic casing for the waistband so I took off about 1 1/2″ to account for that. Good question! Thank you so much for your guidance! I’m excited to finally have a pair of fancy mama pants! Please, please show me the fancy pants!! I must see them!